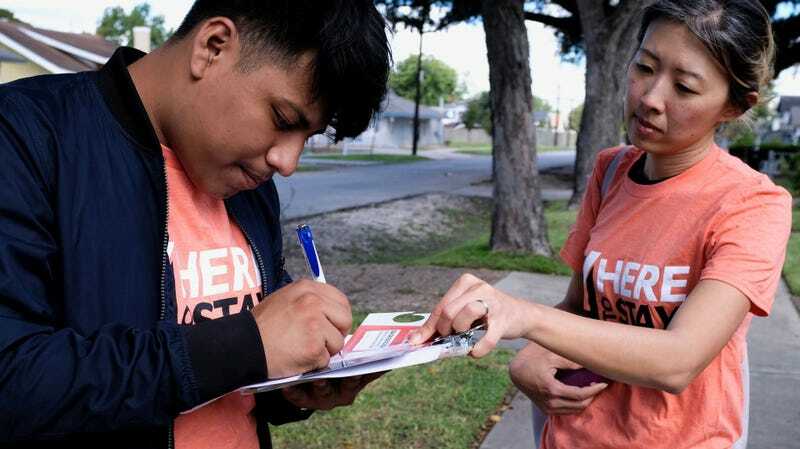 HOUSTON, TEXAS — On the Saturday before election day, Hector Angeles, 20, and Oscar Cedillo, 17, were knocking on doors to get out the vote for Beto O’Rourke, dressed in bright orange shirts that read “Here to Stay.” The two, both members of the immigrant rights group United We Dream Action, were canvassing in a largely Mexican-American neighborhood in southeastern Houston, filled with leafy blocks lined with orange and pecan trees and charming, if somewhat shabby, small, wood-paneled homes. Part of Hector’s elevator pitch for O’Rourke? “He’s not Ted Cruz,” a line he repeated over and over throughout the course of the day. Unsuccessful, he used a Bic pen to bang on the gate of the house he was canvassing. After a few tries, he turned, shaking his head. “They’re not home.” Oscar wedged a flyer into the gate, and, consulting the get out the vote app on Hector’s phone, went off to the next house. There, a woman opened the door, and the three chatted for a few moments. “She said they’re already planning to vote, so that’s good,” Hector said afterwards, noting the interaction in his cell phone app. Hector finds it frustrating when people who are citizens tell him they don’t plan on voting. “If you’re a citizen, you don’t wake up every morning thinking you’re a citizen,” he said. On Saturday, as they continued making their way through their list of 78 names, Hector was struck by the lack of Beto lawn signs in the neighborhood. “It’s weird, they’re usually everywhere,” he said. At one house they went to, the woman who answered the door asked them in Spanish if they had any lawn signs; she wanted one. “That means the Beto people haven’t really been out here,” Hector suspected. Three hours and three miles later, Hector and Oscar tallied up their work for the day. Together, they had knocked on 33 doors, and talked to eight people, most of whom had either already voted or planned on voting for O’Rourke on Tuesday. Compared to the previous day, when Hector had only spoken with one voter during his canvassing shift, he was pleased. “That was a good one,” he said. Oscar was off to his job as a cook at a Cajun restaurant; Hector, meanwhile, had another shift and another three hours to go.